Astrophysicists at the Harvard-Smithsonian Center for Astrophysics may have found another link as to whether dark matter is composed of primordial black holes. A new study provides further support to the hypothesis that “primordial black holes”, could be the source of Dark Matter. All the iterations of matter we see, Earth and everything that’s within including us, distant stars and galaxies, only make up roughly 4 percent of the known universe. The remaining 96 percent is invisible to our eyes, undetectable by our measuring techniques, and as a concept, obscure to our minds. Part of this hidden world is dark matter that physicists proved its existence through its permeating and noticeable effects on the cosmological scale. Another puzzle in physics is the black hole, which, like dark matter, doesn’t emit light and thus can’t be seen or detected. Again though, their existence has been detected and proved numerous times. It seems that these two concepts have more in common than we thought. When we break down ordinary matter (baryonic matter) to its basic microstructure, we find the same atomic particles: protons and neutrons in the nuclei around which electrons revolve. Even the exotic states of matter, like the Bose-Einstein Condensate and plasma, though following a different recipe, contain these essential ingredients. This isn’t the case with dark matter. If dark matter explains the “missing” mass of the Universe, we have yet to pinpoint its “particle” or chemistry. All the knowledge behind dark matter can be boiled down to two things; first, that it doesn’t emit or reflect light. Secondly, researchers estimate that dark matter comprises about 25% of the universe’s mass. Other than that, we’re in the dark. As another type of dark astrophysical objects, black holes are also part of this world that hides in plain sight. Recently astrophysicists made a breakthrough by detecting the gravitational waves of two merging black holes, using Ligo detectors in Louisiana and elsewhere. But could there be a link between dark matter and black holes? Astronomers from the Harvard-Smithsonian CFA say yes. Because they’re so massive, stars go through a slow and long lifecycle that lasts hundreds of millions of years before finally flickering out. Astronomers know that black holes are born in the heart of these violent supernova explosions following the gravitational collapse of stars. Apparently, however, not all black holes are equal. There’s another speculative type of black holes that don’t necessarily follow the same process to emerge, and astronomers have a name for them: primordial black holes (PBHs). 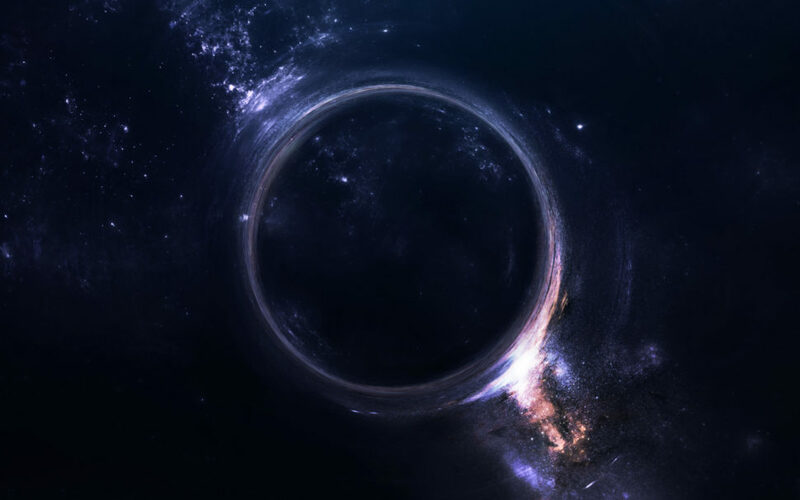 Hypothetically, and as you can infer from the name, primordial black holes are ancient black holes that formed soon after the birth of the Universe itself. Unlike their star-sized cousins, PBHs can’t rise from the ashes of stars because, in the early universe, stars didn’t even have time to form yet. There some theories as to how these black holes could have emerged during the Big Bang. Mainly, these theories rely on the collapse of primordial gas clouds or conditions created by the cosmic inflation. Astrophysicists at the Harvard-Smithsonian Center for Astrophysics set out to find whether dark matter is composed of primordial black holes. Building on previous studies that link PBHs and DM, CfA astronomers ran several computer simulation models focusing on faint dwarf galaxies. They also surmised that these black holes would have masses between 2 and 14 times the mass of the Sun. Another study from last year suggested that primordial black holes could cluster to form dark matter. However, the nature of dark matter is still a mystery. Future studies will certainly shed light on the nature of this relationship. For now, however, all we have is an enticing peek into the possible relationship between these two celestial entities. Is it a surprise that DM and PBHs could have something in common?